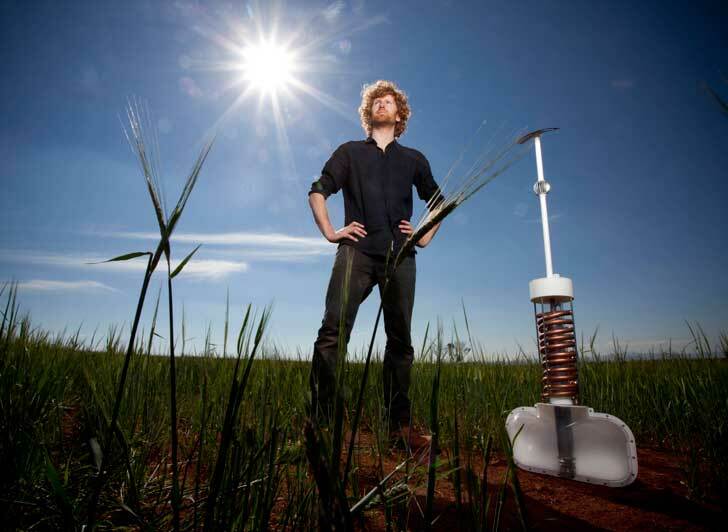 The 2011 James Dyson Award has just been handed to Edward Linacre of Melbourne, Australia for his Airdrop irrigation system — a device capable of transforming drought-ridden areas into fertile farmland. The Airdrop is modeled after the Namib Desert beetle, which is able to live in the driest of conditions by capturing and collecting small amounts of water from the air. Linacre's irrigation system harvests tiny amounts of moisture from even the driest climate and then pushes the moisture through a network of piping that condenses it and funnels it directly to the roots of crops. Linacre's winning design netted him a prize of about $16,000, which he'll use for testing. Linacre was inspired to create his design because of the effects of climate change on his native Australia. Droughts have plagued the country recently and he was looking to mitigate the loss of ecosystems to lack of water. Linacre’s system solves many problems that plague farmers during droughts, in addition to providing water it brings moisture to crops below the soil’s surface where it is not likely to evaporate in high temperatures. The Airdrop provides a self-sufficient system that could help solve many of the irrigation problems facing drought ridden farms by harvesting and watering crops with its efficient method of extracting small amounts of moisture from the air and feeding it under the surface soil. In high winds the turbine that provides the air flow in the system can run with the power of the breeze, and in low winds there is a solar panel attached to provide the energy to spin the turbine and capture air. The design is also outfitted with an LCD screen that allows for monitoring by the farmer. It displays reserve water levels, solar battery life and the health of the system. With climate change becoming an increasing problem in agricultural communities around the world, solutions for growing crops in even the harshest of weather patterns are coming into increasing demand. Here, Edward Linacre’s Airdrop system seems like a self sufficient farm savior. Is this device available for sale? Really amazing.nobody can expect this. this is really very very helpful not only to the farmers of Australia but also world wide. Our Indian farmers are very much benefited if it comes in reality within short time . We indians are expecting eagerly for the arrival. once again my heartly congratulation Edward. Keep it up. Its a unique invention,which is applicable to mankind.I shall be happy i you could enlighten me more on this,so that I can try to be of some help to the marginal farmers in India. what is the cost of this system? can it be used now? if not, what other effective system is there available now? what are the restrictions, land mass, that this system can be used on? how many acres? the proposed land mass is 20 acres to be bordered by trees, with a proposed garden to feed inhabitants. Anyone else remembering the wind-traps from DUNE? All the Aussies need now are stillsuits and weirding modules . . .
Linacre was inspired to create his design because of the effects of climate change on his native Australia. Droughts have plagued the country recently and he was looking to mitigate the loss of ecosystems to lack of water. Linacre's system solves many problems that plague farmers during droughts, in addition to providing water it brings moisture to crops below the soil's surface where it is not likely to evaporate in high temperatures. The Airdrop provides a self-sufficient system that could help solve many of the irrigation problems facing drought ridden farms by harvesting and watering crops with its efficient method of extracting small amounts of moisture from the air and feeding it under the surface soil. In high winds the turbine that provides the air flow in the system can run with the power of the breeze, and in low winds there is a solar panel attached to provide the energy to spin the turbine and capture air. The design is also outfitted with an LCD screen that allows for monitoring by the farmer. It displays reserve water levels, solar battery life and the health of the system. With climate change becoming an increasing problem in agricultural communities around the world, solutions for growing crops in even the harshest of weather patterns are coming into increasing demand. Here, Edward Linacre's Airdrop system seems like a self sufficient farm savior.